After eight years as an idea and four years in active making, Vision Éternel’s long-anticipated boxed set “An Anthology Of Past Misfortunes” is finally out! Released through Abridged Pause Recordings, the collection features five compact discs, one cassette, two stickers, six business card flyers and a two-page postcard insert. The five compact discs include all five Vision Éternel extended plays released to date, covering 2007-2015: “Seul Dans L’obsession” (2007), “Un Automne En Solitude” (2008), “Abondance De Périls” (2010), “The Last Great Torch Song” (2012) and “Echoes From Forgotten Hearts” (2015). The cassette compilation, “Lost Misfortunes: A Selection Of Demos And Rarities (Part One)” features nineteen rare and unreleased b-sides, demos and alternate versions spanning 2007-2010. All of this audio content has been remastered and most of it appears in a physical format for the very first time! The collection also includes a handful of bonus material: business card-sized reproductions of the original promotional flyers for each of the five extended plays as well as the 2009 flyer for the Japanese-exclusive compilation; two stickers: one of the 2008 band logo designed by Jeremy Roux and another of the 2017 band logo designed by Christophe Szpajdel; and two postcards with original artwork by Rain Frances and Pierrette Bourdon backed by liner notes. The assortment is packaged in a deep blue keepsake box, limited and hand-numbered. The idea of the boxed set originated in early 2010, following Abridged Pause Recordings’ release of Vision Éternel’s third extended play “Abondance De Périls“. The year prior, Japanese record label Frozen Veins Records released a compilation of Vision Éternel’s first two extended plays; 2007’s “Seul Dans L’obsession” and 2008’s “Un Automne En Solitude“, both originally released through Mortification Records. The Japan-exclusive compact disc, titled “An Anthology Of Past Misfortunes“, included three unreleased b-sides and was bundled with a poster. 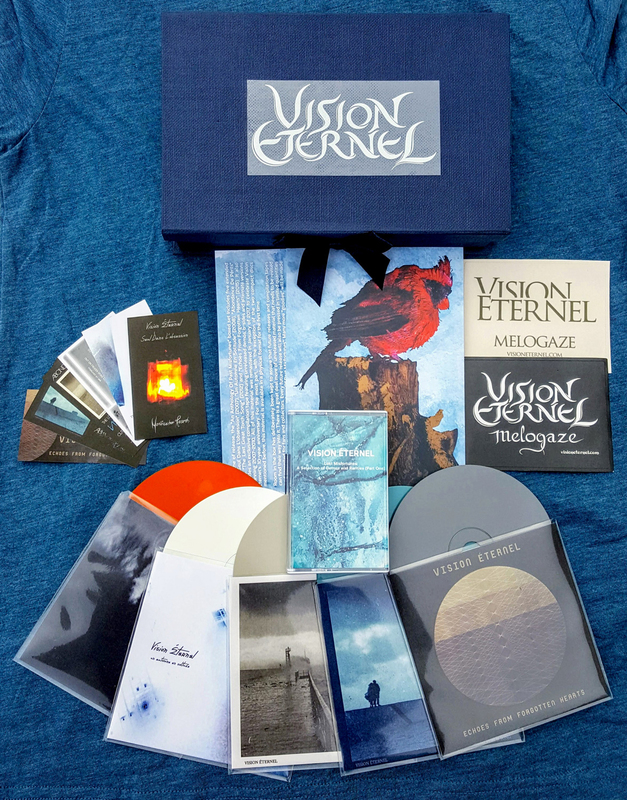 When that compilation was released, on February 14th of 2009, the future of Vision Éternel was uncertain and it was promoted as a sort of discography of the band. Once more material was released in 2010, Vision Éternel founder Alexandre Julien started planning a follow-up compilation compact disc for Frozen Veins Records, which would have combined “Abondance De Périls” and its eventual sequel, 2012’s “The Last Great Torch Song“. Unfortunately, Frozen Veins Records folded in the early months of 2010 and the release was briefly put on hold. Within a month, the compilation was re-conceptualized into a boxed set. This boxed set was to re-use the title “An Anthology Of Past Misfortunes” because Alexandre Julien found that it perfectly represented the mood and theme of the band. 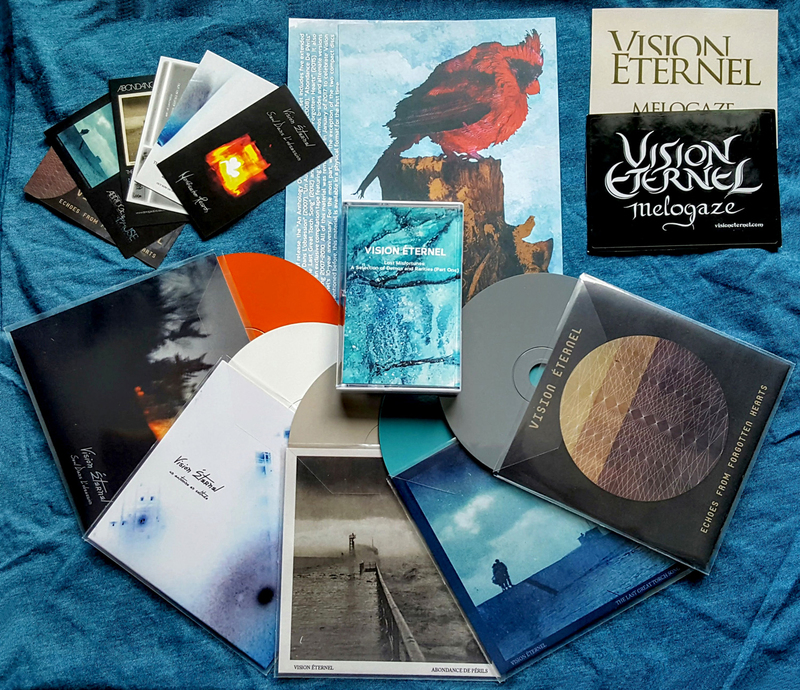 The collection was upgraded to include every Vision Éternel song ever released. During the four years that followed, a long list of record labels offered to release the boxed set, including Winterreich Productions, Valse Sinistre Productions, Dedicated Records, Dunkelheit Produktionen and Broken Limbs Recordings, which resulted in drastic changes in the formats and contents of the collection. Ultimately, Abridged Pause Recordings took the reins, following the record label’s release of Soufferance’s boxed set “Travels” in August of 2013. Thus ensued the long and emotional task of putting the boxed set together. Between March of 2014 and March of 2018, many different parts of the boxed set were designed, crafted, purchased, manufactured and printed (and a great many parts had to be re-designed, re-manufactured and re-printed due to ongoing problems). Alexandre Julien envisioned the “An Anthology Of Past Misfortunes” boxed set as the definitive Vision Éternel collection, not limited to every Vision Éternel song released, but rather to every Vision Éternel song recorded. This would normally only be attainable if the boxed set was completed and released after the band calls it quits. But Alexandre Julien found another way; release the boxed set in an impressive package in the spring of 2018, but leave room in the box for yearly “add-on packages”. With that in mind, the keepsake box used for the collection was intentionally crafted bigger than it needed to be, so that as future albums are released, a limited edition pressing will be manufactured to retroactively fit in the boxed set. The yearly add-on packages will also include bonus material such as stickers, flyers, postcards and other memorabilia made to subsequently fit in the boxed set. The boxed set can be purchased directly through Vision Éternel’s webstore as of April 14th 2018. All music composed and performed by Vision Éternel. Vision Éternel is the creation of Alexandre Julien. Music recorded, produced and mixed by Alexandre Julien at Mortified Studios from January of 2007 to December of 2014. Mastered by Adam Kennedy at Vital Philosophy and Garry Brents at GAB Recordings. Remastered by Alexandre Julien at Mortified Studios in January of 2017. Artwork, illustrations, paintings and photography by Alexandre Julien, Marina Polak, Jeremy Roux, Rain Frances, Pierrette Bourdon and Christophe Szpajdel. Released on April 14th of 2018 through Abridged Pause Recordings – APR14. All songs released are exclusively registered to Abridged Pause Publishing. An Anthology Of Past Misfortunes is dedicated to Pierrette Bourdon.